Off leash dog training??? 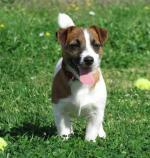 Every dog owner wants to be able to say that their dog is reliable whether a leash is on or not. OK, maybe partly because it sounds cool when you tell your buddies, but mostly because of the control and safety that it gives you and your dog. Who hasn't watched with envy at the park or dog beach as an off leash dog races back at a word from his human, the bond between them as clear as day? Off leash reliability doesn't just happen overnight. The majority of dogs are not ready to be completely off leash until you have been training together for about a year. And I mean consistent, daily training. Dogs become rusty very quickly if you slack off and stop training regularly! In our fast-paced human world, we're used to instantaneous results - instant downloads of movies, e-books, and songs, credit cards which allow us to buy things right now, cellphones, microwaves, you name it. Guess what? It doesn't work like that with off leash dog training. On the contrary, the longer you spend on each step of training, the more reliable your dog will be. One of the first exercises you'll probably think of is the recall, or come command. While obviously this command is really important, it can be just as crucial that your dog listens immediately to a command to sit or stay off leash. For example, you won't want to call him to come across a busy street, but it would be best for him to sit or stay on the other side! Many owners make the all-too-common mistake of assuming that their dog will listen to them off-leash because he has been through puppy school, or listens quite well on leash, or even simply because he loves you. Unfortunately, this really isn't the norm. Lassie looks great on TV, but it's a movie, not real life. Oh, you know real life. Real life is when you open the front door to get the mail and your hound bolts through your legs and across the street after a squirrel. Real life is when you're at the dog beach madly racing after Rover who got a taste of freedom and is not coming back. I remember before I was a trainer how often I had to chase my wayward pooch around the neighborhood! That being said, it doesn't have to be like that. Most trainers (myself included) teach that advanced level and off leash dog training builds upon everything taught in the basic training levels. Training moves in tiers - tier 1 is on a 6 ft. leash, tier 2 is on a long line, and tier 3 is e-collar training (leading to naked dog training). Most dogs and owners will use an electronic dog collar during their 3rd tier of training. This is the step that must be taken before you can do "naked dog" training - no leash, no collar. At the risk of stating the obvious, if your dog doesn't listen to you while on a leash, he's not going to give you the time of day off leash, either. So let's rewind a bit... and start from the very beginning. Whenever I train a puppy or older dog who isn't off leash reliable, I start with teaching basic obedience on a 6 foot leash. If you're unsure of how to go about this, it's best to take a basic obedience training course with a trainer in your area. 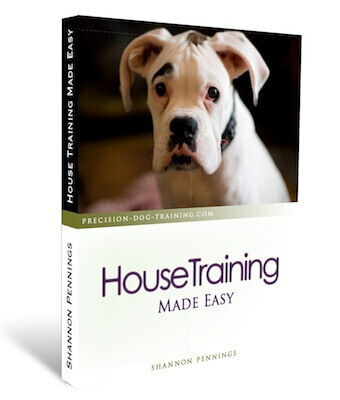 I personally find the balanced training approach to be the most effective and easiest for dogs to catch on to, but you'll have to decide for yourself which dog training method to go with. These basic commands should include sit, heeling, sit-stay, stand, down, down-stay, and come. I've said it before, but don't take off the leash at all while training at this stage! Dogs naturally repeat what they are successful at, so if your dog becomes successful at ignoring your commands while off leash dog training, this is the behavior that he will continue to do. Make sure your dog is solid with basic obedience before doing off leash dog training. A really great example of this is the recall: If you call your dog to come to you while he's off leash, and he decides to run the other way, you're left chasing him and he learns that he doesn't have to listen. By keeping your dog on a leash, you can reel him in if he decides to ignore your commands, and teach him that he always has to listen. In this next tier of training, you'll use a 30 to 50 foot long line to begin increasing the distance between yourself and your dog during training. You can find one at most pet stores or even tack shops (a horse lunge line will work, too). Again, if you're dog can't do a sit-stay for longer than a 30 seconds when you're standing 6 feet away holding the leash, he won't be able to stay when you walk 30 feet away! Continue working on the basic commands you've already taught your dog, but slowly increase the distance that you go away as well as the length of time for stays. Here's where your hand signals gain importance - your dog needs to be able to see and understand a hand signal for the different commands at a distance. Just as with any training, you're going to see improvement when your dog is consistently successful. So set him up for success when doing off leash dog training! 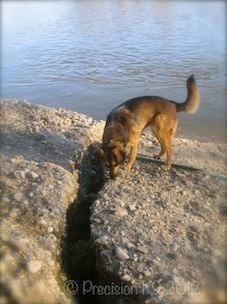 My dog, Justice, exploring on a long line during off leash dog training. If you know he's been having trouble staying when you're 25 feet away, move in closer for the next bunch of stays so that he is successful - you'll build his confidence by doing this, and create a more relaxing atmosphere. I'm always amazed at how dogs can read your mood and body language like a book, and being stressed and frustrated will only cause your pooch to get anxious and have a harder time learning. A long line is the perfect tool to use to better a dog's recall, too. Use it whenever you are outside with your dog until you are 150% sure that he will come when called immediately, even under distraction! I used to take Justice to the park, the beach, and the trails on a long line. Remember, if you can prevent your dog from being able to ignore your call to come by using the line to reel him in, you can avoid it from becoming a bad habit in the first place. 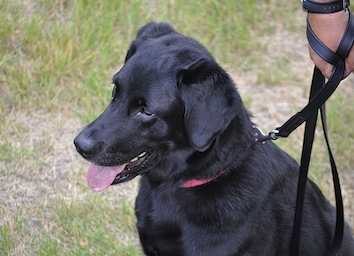 The last tier of off leash dog training is the electronic collar, or e-collar. I love my dog to pieces, and would never use anything to train her that I thought might harm her. Used correctly, an electronic training collar is safe, humane, and effective. As is the case with any training tool, I don't recommend anyone use this type of collar without getting some hands-on training with a certified professional trainer. You'll see many sporting dogs wearing e-collars - hunting and birding dogs, in particular - and they often have a built-in GPS, too, so their handlers can locate them while in the field. Built and designed to hold up against the elements, these collars are often water-proof or water-resistant for off leash dog training. Another type of e-collar is a vibrating collar, which is used most often for training a deaf or blind dog. The dog is trained to respond to different series of vibrations for different commands, thus giving the owner a way to communicate with the dog. The key to transitioning from an e-collar to naked dog training (where your dog wears no leash and no collar at all) is to make sure that your dog doesn't have negative associations with the collar. I always make training fun, and my dog associates her e-collar with treats, dinner, playing in the backyard, sniffing in the field, and walks. For the first 1 - 2 weeks, don't ever give your dog a correction with the e-collar. Don't even turn in on!! Instead, the first time you pull the collar out, make a big deal about it and get your dog interested in it. Let him sniff it, then clip the collar on (don't try pulling it over his head) and immediately give him a treat. Then take the collar off again. Repeat several times. Make your dog get excited when the collar comes out! Put it on him, and then play his favorite game. Or put it on and immediately give him his dinner. When you go for a walk, put the e-collar on along with his regular collar. You can let your dog wear it during the day as long as someone is home - make this collar a part of his normal daily routine. He can nap with it on, go for a car ride with it on, chill out in the house with it on. These Weimaraners enjoy some time off leash in the field. Once the desensitization period is over, continue these fun collar games whenever you pull it out for training, too. This will ensure that your dog doesn't fear or hate this collar, and he won't become "collar-trained" either. This is when a dog behaves with the collar on, and misbehaves when the collar comes off. Now you can start working on off leash dog training using the e-collar. When you and your dog first begin work with an e-collar, I recommend continuing to use the long line as well for the first week. Instead of giving a leash and collar correction when your dog doesn't follow your commands (assuming that he has been trained and has practiced this command for at least 6 months without the e-collar), you will press the button on your remote to correct. This will cause your dog to feel an electronic stimulus on his neck - similar to the feel of touching a doorknob after rubbing your socked feet on the carpet. I am a big fan of trying any tool I will use on my dog myself. You can do this by holding the collar posts on the palm of your hand. Keep this in mind - all that fur around your dog's neck does decrease the effect of a correction. That being said, all dogs have different fur thickness, so you'll have to adjust the level of correction accordingly. I also don't think it's fair to correct a dog without giving them a chance to comply. Wait three seconds after giving your dog a command before correcting, as it may just take your dog a few seconds to move their body into certain positions. It's also only fair that the punishment should fit the crime... I would give a firmer correction for my dog bolting towards the road than I would if she didn't sit when I told her to. Oh, and did I mention practice yet? Practice, practice, practice! At home, on the sidewalk, at the hardware store, at the bank (yes, leashed dogs are allowed in many banks! ), on pavement, on grass, on sand at the beach... everywhere possible! The more variety in locations and environment that you can train in, the better. Off leash dog training is a skill that takes a long time to master. Being able to take your dog on the trails or to the beach off leash is definitely a goal worth striving for, though! And I know that you and your dog can reach that goal with a lot of practice and hard work.